Federal Circuit Saves Patentees by ruling that "Before" includes "Just Afterwards"
Sometimes one day makes a big difference – especially if you accidentally missed yesterday’s deadline (or if you misread the statute). The case here is about the deadline for filing a continuation application under 35 U.S.C. § 120. The general rule for filing a continuation application is that it must be filed while the parent application is “alive” – before the parent is either patented or abandoned. The statutory language for this requirement statues that must be “filed before the patenting or abandonment of or termination of proceedings” of the parent application.” Id. Since patents are thought to issue at 12:01 am on their appointed date of issue (and thus are enforceable any time that day), the statutory language seems to suggest that a proper continuation must have been filed on the prior-day in order to have been “filed before . . . ”. The PTO has never gone-in for that interpretation and instead has long stated in its regulations that continuations may be properly filed on the issue date. On appeal here the Federal Circuit contravenes that statutory language and sides with the PTO interpretation. In particular, the court holds that a continuation is properly filed on the date of issuance of the parent application. In reaching this decision, the court looked to the long history of allowing same-day-continuation filing and support from the PTO. To bolster its decision supporting the PTO, the court interestingly indicates that the PTO’s interpretation of the deadline is “essentially procedural.” As a result, the PTO’s statutory interpretation should be given weight rather than considered de novo on appeal. The decision by Judge Taranto and signed by Judges Prost and Linn. Because of the clear pro-patentee outcome of this decision and textual strain, a well positioned petition for certiorari has some chance. They had to decide it this way. If they had gone the other way, they would have provided ammunition for the patent lobby that they are anti-patent. This one was a gimme prediction. Just a friendly reminder: what was ‘expected” and deemed “settled” by you and your clients was not necessarily “expected” or “settled” in the minds of other attorneys and their clients. Put another way, nothing was ever “settled” about the eligibility of patents reciting an old data gathering step and a “new” mental step, and nobody should expect or should have expected their “do this otherwise ineligible logic on a computer” patent to be enforceable. The PTO can and will get it wrong, occasionally catastrophically. Until the Supreme Court or Congress settles this issue permanently, why would anyone add the admittedly small amount of uncertainty by filing a Continuation on the day its parent issues (assuming no special circumstances)? Hierarchy, did not you know that the basis for the Federal Circuit holding primarily was upon controlling Supreme Court authority that held in an 1864 case that if the applicant withdraws his application with the intention of filing another disclosing and claiming essentially the same invention that the second application constitutes a continuation of the first. In that 1864 case, the new application was filed on the same day that the first application was abandoned. The Federal Circuit believed that Congress did not intend to change the prevailing law when it formalized continuation practice with by enacting § 120 in 1952. That is a reasonable assumption. There is no chance that the Supreme Court will take this case or any case like this case that is so obviously correct. I’d say that the patent issues during business hours not some hypothetical 12:01am assumption, so by filing same day, they’re both technically pending that day. What’s the problem? Right, before “issuance”. Whose to say you didn’t file at 12;01am and the patent issues when the pto opens for business? Um, maybe the EFS-Web acknowledgement receipt that indicates you filed it at 10:30 am after a thorough final review just like you always do? Or if you’re old school and using E-M, that receipt also indicates time of deposit…. The fact that “digital information” is eminently trackable (if desired) in today’s day and age appears to be in conflict with a system that wants to ignore that capability and instead of factual designations lean instead to legal ones. See the post 1.1.1 below by semianonymous. Doesn’t the law firm that sought invalidation of the continuation patent have a duty to its other clients that have issued patents filed on the day a parent patent issued? David Hricik–any thoughts? In California, no. In Oregon, yes. According to the ABA Model Rules, I think it is ambiguous. Inconsistent positions in different tribunals are permissible. Perhaps, under the Model Rules, in this particular situation, any firm that has obtained patents filed on the issue date of a parent would have a disqualifying conflict. Essentially, the defendant would have to find a patent litigation firm with no prosecution experience (or, at least, so little experience that never filed a continuation on the parent’s issue date). Well, that issue is settled. Of course it was settled for decades before this dopey trial judge decided that everybody else had it wrong, but he knew better. Agreed. When so many people – including the administrative agency tasked with implementing the statute – have for so long understood the statute to mean you can file a continuation on the day the patent issues, a court doesn’t invalidate a whole swath of patents by telling all those people they misunderstood the statute and filed late. At least, normal courts don’t do that, so we see from this that at least some CAFC judges still retain a vestige of sanity. But after Mayo and Alice, which completely FUBARed settled expectations about patent eligibility, who knows what the irksome eight might have to say about this? For Breyer this would be a convenient way to knock out yet more patents. Breyer . . . don’t get me started. According to the Court, it was settled by the Supreme Court in 1864. So? The court led the 1864 case controlled unless Congress acted to overturn. Nothing in the legislation suggested that. I am a bit surprised that Chevron deference was not mentioned nor was the APA. Mike, there is the matter of controlling Supreme Court authority. I wonder if Immersion’s prosecution attorneys would have a potential malpractice suit against them (assuming no statute of limitations issues) if Immersion lost this case. After all, the statutory construction issue is well known and my firm has a policy against same-day filing. If the CAFC went the other way on this issue, I would imagine, based on IPO’s statistics, that a large segment of the patent bar would be at risk for malpractice suits. So, despite Dennis’ apparent disappointment with the outcome, I’m sure there are a number of patent practitioners resting easier tonight. There was some discussion about this around the time of the oral arguments. As it turns out, it’s a pretty small percentage of continuation applications/patents that would be affected (around 1%, as I recall … maybe even less). That does not sound like much in relative terms. 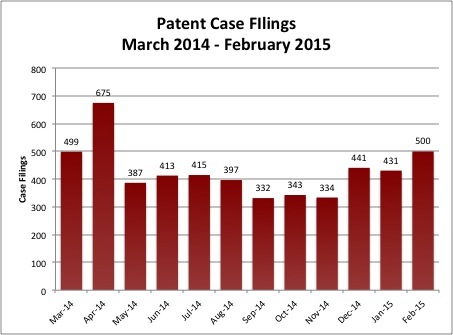 However, that 1% translates to at least over 12,000 cases and probably has broad reach across the patent bar. Ocean Tomo pegged it at 12, 300 issued patents (per IPO brief), plus an estimate of another 30,000 patents that might be affected by “abandonment” (instead of issue) being the event that might break the chain of continuity. How many actual litigation cases were there last year…? Cool story, but I’d wait for the movie where a “prior” art is published on the day of filing but earlier in the day than the application is filed. This holding is technically wrong, but nobody will care. As an aside, did anyone else notice how the court made it clear it was reversing Judge Andrews, not Judge Dyk, sitting by designation? Yes – they did it parenthetically! Well given how courts bend over backwards to go along with the PTO when it disfavors applicants/patentees, it would be pretty galling if they drew the line here now. As for cert, same thing, especially after Cuozzo. Not to mention this is a pretty trivial matter overall. Meh… guessing this won’t make waves except for anyone in HTC’s position. But as a practical matter, who doesn’t always file their cons/divs latest on the Monday of the week of parent issue? Wonder what happened here – did the client say “no thanks, no thanks, nope” up until Tuesday morning when it suddenly decided it wanted the con filed? As a practical manner, many do not file continuations on Monday, notwithstanding your perfectly valid point that it is not so smart from a management standpoint. What if something goes wrong? Waiting until Monday or Tuesday to tell the patent attorney to file a continuation is very common: The more experienced the client, the more likely it is (they know that the deadline is Tuesday). They are just so busy they can’t tend to minor things like the patents that protect their entire product line. One solution is to lie to the client: Tell them you have to file on Monday to maintain pendency. But given that the entire patent world (minus one defendant and one judge) deems the deadline to be Tuesday, you cannot honestly tell the client the deadline is Monday. In the old days (I can’t believe I am so old that I survived the old days) you had to file a continuation when you paid the issue fee, even though it often took many months to issue after payment, because the PTO often mailed the issue notification a week after the patent issued. If this decision interests you, I highly recommend listening to the oral arguments. Everyone involved brought their “A” game (and that’s not always the case). wow, MM actually said something positive about another attorney. 48 minutes of my life that I will never get back. Bad – but minor – decision. I’m not sure if it was addressed, but this case could also have been resolved by noting (1) the lack of temporal granularity in the statute, and (2) HTC’s failure to bring forth clear and convincing evidence that the “issued” patent was finally printed and released to the public before the moment that the continuation application was filed. Acknowledging a legal fiction between “legally issued” and “actually issued” is necessary to the ruling here, but that is already the status quo and binding on the panel. A patent unavailable to the public can be enforced against the public for several hours, even though the accused infringer has no access to the patent. The ruling seems to go one step further—a continuation can be filed after the “legally issued” –and– after having “actually issued”. I’m skeptical that a cert grant is likely. I just don’t see four votes. This decision would have driven Justice Scalia nuts, but I think the remaining justices are either (1) reluctant to disrupt settled expectations, or (2) are more liberal in how they treat issues of statutory construction. Where do you see four votes? Based just on the opinion, I don’t think a cert petition gets even one vote. Scalia was an administrative law and would have understood the artificiality at the margins here. Patents don’t actually issue at 12:01am, even if they’re enforceable at that time. No I agree it is unlikely especially since the timing no longer extends patent term. In a normal term there probably aren’t four votes. But the Court seems to have granted significantly less than normal for next term, has ducked some major constitutional issues, and this is an incredibly clean issue for them on statutory construction which could have a major impact. Don’t be shocked if this gets granted. What part of the statute says “12:01”? A patent is enforceable for the entirety of its calendar-date of issuance. My understanding of our time conventions is that the beginning of a new calendar day is 12:01 a.m. This is not a case, as we have explained, where the language of the statute actually contradicts the longstanding judicial and agency interpretation. Nor is it a case in which the longstanding agency position is plain- ly outside the agency’s granted authority. Here, the position is an essentially procedural one establishing when the agency will consider an input into its process (the legal act of “filing”) and an output of its process (the legal act of “patenting”) to occur relative to each other— neither one being a precisely identifiable self-defining physical act, but a legally defined event. Listening to the argument, I wonder where the idea comes from that the patent is in force for the entire day it issues. Taranto asks the DOJ person about this at 18:50-19:30, and the DOJ person says that that’s an assumption that the CAFC has never endorsed. But if the notion that a patent is effective and in force at 12:01 AM on the issue date is not mandated by the statute (it is not), then such a notion should not be enough to contradict an agency decision or an ambiguous law. Given the lack of granularity in when a patent issues, it is just a matter of opinion whether an application filed on the issue date is filed before or after the patent issues. In this case, it certainly seems prudent to defer to the agency interpretation. Bob, this is not really a matter of agency determination. The ’52 Act only codified existing law from the Supreme Court decision of 1864. Existing law allowed the patent to be abandoned/issued on the same day it was refiled as a continuation. Sometimes the headlines on this blog are wrong and appear to be written to generate traffic. This is not one of those times. It is implied in that you can file a lawsuit at 12:01am on your new patent that issued. In the morning you can file an agreed judgement and injunction, and later that morning call up the court’s clerk to ask them to get the judge to sign off on a final judgement before the day is out. Then, having successfully enforced your patent, file a continuation before you go to bed. UH Grad, there is nothing wrong with your analogy. The patent and the continuation are two different things. Just one of the nightmares of being a patent attorney, the ultimate fall guy. Love the discussion.